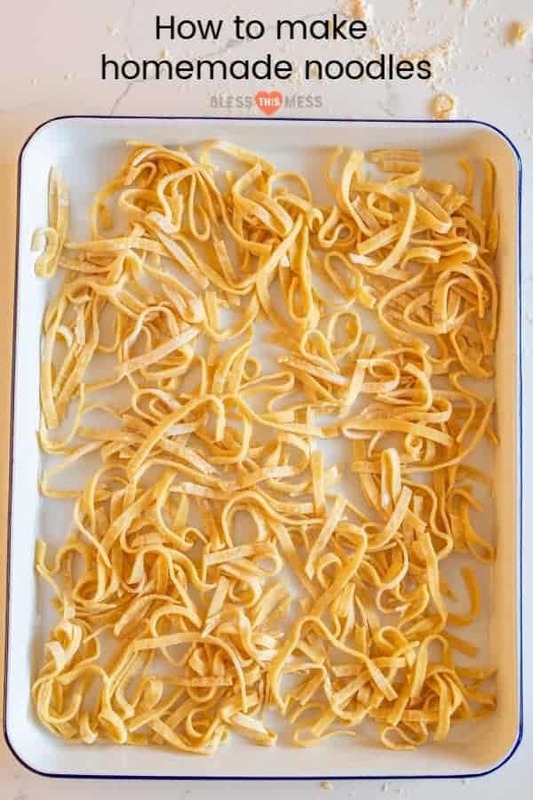 A simple guide on how to make homemade noodles with just a few simple ingredients – just like my grandma makes them. Fun fact: I have an amazing grandma who comes out to Utah from Indiana to visit every so often. I’ll often ask her to cook things with me and my kids on her short trips because kitchen and food memories are my love language. A few years ago she came out and made homemade noodles with my kids and since then my kids have referred to her as “Grandma Noodle.” How cute is that? In order to pay a little tribute to Grandma Noodle, I thought it be appropriate to share her noodle recipe with you. Homemade noodles are one of those simple pleasures in life that just feel good to make and even better to eat. Making pasta from scratch isn’t complicated or even hard, but it does take some time and energy. Making “slow food” like this is one of my favorite activities to do when life feels busy or when I need something mundane to keep my hands busy while thinking. 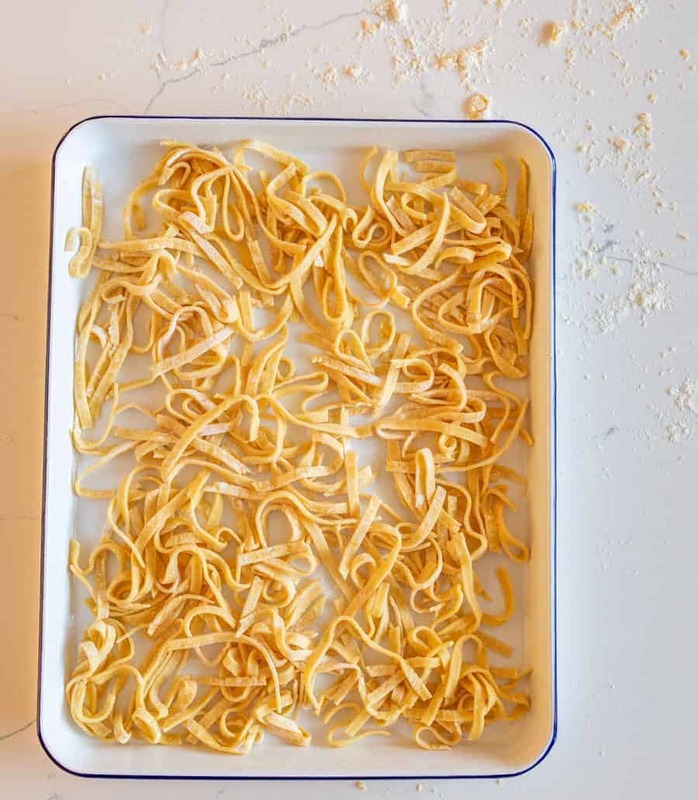 Making homemade pasta is also a favorite activity in our house during the cold months when the weather isn’t great and the kids are stuck inside. There’s something magical about flour and eggs rolled into fresh pasta. Serve them in soup or with a simple red or white sauce on top. You can’t beat homemade pasta. Roll it however is easiest for you. Thomas bought me this pasta roller for my birthday a few years ago, and I love it. No pasta roller? Just roll your dough out with a rolling pin and use a knife or even a pizza wheel to cut it into noodle pieces. Don’t over think it. Homemade pasta tastes great no matter how it’s cut! This recipe is really easy to scale up if you’d like to make more noodles. I normally triple the recipe and eat half the same day and save the other half in the freezer for a second meal later. If your dough is pulling back and trying to keep its shape when you try to roll it out, let it rest another 10 minutes. If your dough is very sticky, add more flour. If your dough is very dry, put it back in the bowl and mix in additional milk or egg until it’s workable. This is a great recipe to make with kids. Mine love to use mini cookie cutters to make noodle shapes which we just cook up and serve with a simple pasta sauce. 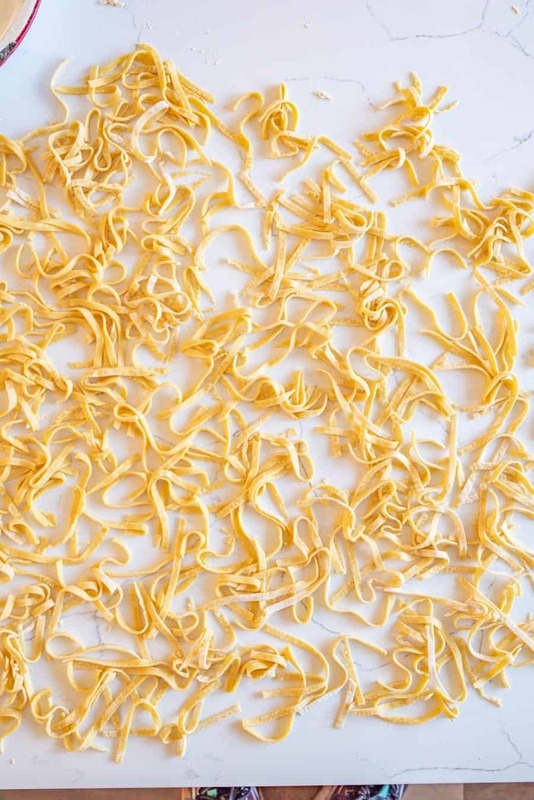 How do you make egg noodles from scratch? It’s easy! 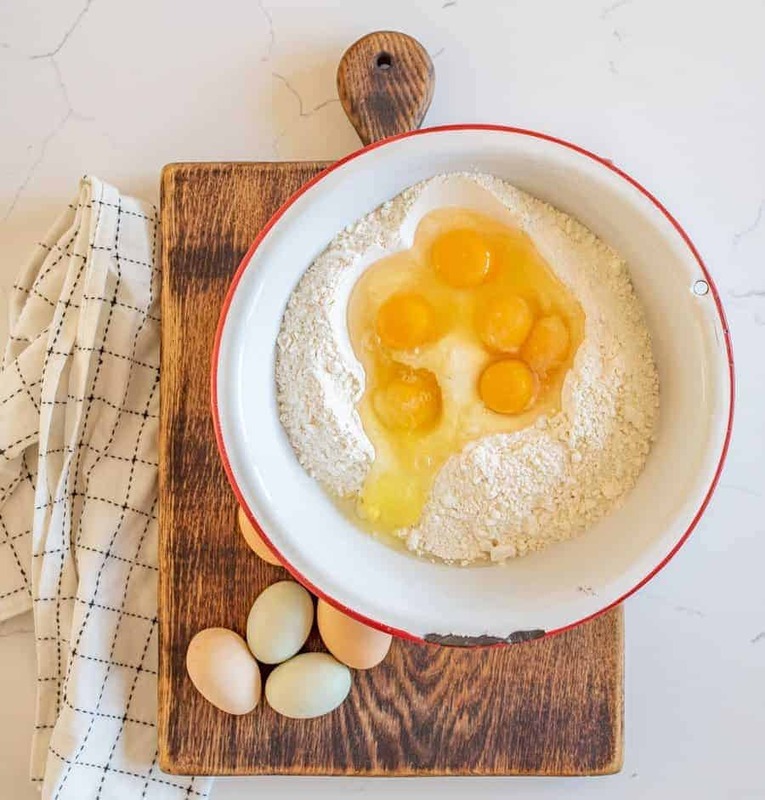 Simply add a little flour and salt to a bowl, mix in eggs and a little milk until it’s a workable dough. Then roll, cut, and boil! Do homemade noodles have to dry before cooking? No! You can cook your fresh pasta right away in a pot of boiling water or broth if making soup. Fresh noodles only take about 3 minutes to cook, though. Take note of the shorter cooking time so that you don’t overcook your pasta. How do you make homemade noodle soup? I have a great recipe for that! Classic Chicken Noodle Soup made with homemade noodles is the best. 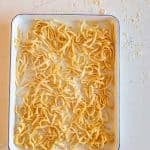 You can cook the noodles right away (for about 3 minutes in hot boiling water or broth if making soup) or you can let them dry overnight and then store them in an air-tight container in the freezer for up to 3 months. I like to make this recipe in large batches on purpose so that I have some to stash in the freezer for later. In a medium mixing bowl, add the flour and salt. Use a fork to combine. Add the eggs and milk to the bowl. Use your fork to stir and combine well. When the dough starts to come together, turn it out onto a well-floured surface and knead lightly to form a smooth dough. Let the dough rest on the counter for 10 minutes. Divide the dough into 4 or 6 parts and roll with a rolling pin on a lightly floured surface until it is about 1/4 to 1/8 of an inch thick. Use a sharp knife or a pizza wheel to cut the thin dough into noodles, making them the size you prefer. Instead of rolling by hand, you can use a pasta roller to roll and cut your dough (my grandma made so many homemade noodles that she got a pasta roller at some point and used it for years). You can cook the noodles right away (for about 3 minutes in hot boiling water or broth if making soup) or you can let them dry overnight and then bag and store them in an air-tight container in the freezer for up to 3 months. Who else loves making food like this? Have you made homemade noodles before? I’d love to hear if you have! Thanks for stopping in. Enjoy this recipe from my kitchen to yours. Do you let them dry overnight open? Yes! If you’d like you can cover them with a light flour sack towel or something to keep any dust off but I just let them dry on my bar, uncovered over night most of the time. What is the cooking time for frozen noodles? They’ll cook in about 5 minutes. Still faster than traditional noodles but a few minutes longer than the fresh, non-frozen!